Q: Since you write both fiction and non-fiction, do you find that one form requires more personal information or interaction than the other? A: No, not exactly. One doesn’t have more personal information than the other. For writing fiction, the story itself may not be “true,” but the details will come from my life or my experiences a lot of the time. I find it really fun to embed things from my life into my stories, like little Easter eggs that you can find while reading. But fiction is about inventing worlds, creating characters and wondering what they would do — it feels a bit more external. Compared to non-fiction, such as what I’m working on now, where I’m looking up stats on sexual violence and thinking about my friends and their experiences — that feels extremely personal. I have an essay “Hold Your Breath: Refusal to Report Sexual Violence Isn’t Just about Stigma,” which was published by Antigravity in January of 2016, and I was resubmitting to a website about gender parity in the literary world. I had to rework it for that publication because my original essay wasn’t super detailed and didn’t talk specifically about my experience of being stalked while in an MFA program. I had documented a lot of what happened with text messages, emails, and all the constant contact, so I’ve spent all weekend looking over that stuff, showing it to my boyfriend and saying, “Isn’t this just insane?” It’s really affecting me. It’s interesting because when I write fiction — even fiction motivated by my experiences of sexual violence — it doesn’t make me sad. It doesn’t affect me like that. But the experience of researching sexual violence for this essay has just been heinous, so dismal. When I first published the essay with Antigravity, so many of my female friends wrote me and shared these horrible stories of things that happened to them. I think being sexually harassed is probably a universal experience for women, but somehow I never anticipated that part of writing about it. Actually, the first friend to send me a message with her personal experience of being harassed had said, “You’re probably getting flooded with people’s stories,” and she turned out to be right. It was pretty gruesome. So the process of researching, writing, publishing this essay — it’s been real, I can definitely say that. Q: What song most often gets stuck in your head? A: Oh God. That’s an impossible question to answer. I have songs stuck in my head all the time. There was a while where I couldn’t fall asleep after my DJ gigs, and I would lie awake in bed while the songs from the night would play — at full volume — in my head. I actually had to stop playing the Yardbirds song “Over, Under, Sideways, Down” because it has this really … (starts singing) do li di do li de do do do do. I would wake up to that playing in my head. Interestingly, I find that the song playing in my head is usually in the original key. And it’s got all the parts — the full arrangement. This isn’t just me. I found out through talking with my musical friends that they also hear the song playing in the correct pitch. So it’s not just the lyrics that get stuck in your head, but the entire track. It’s so intense. Q: What allows you to stick something out or see something through even if it gets insanely challenging? So I did it. And it was totally terrifying. But I was pretty proud of myself. And that thought process is actually how I ended up DJing. I was in Columbus, Ohio, for grad school, and I wanted to go out dancing. I don’t exactly relish dancing to Top 40 music, and I thought surely they have a ’60s party in Columbus, because they happen all over the country. So, I did the totally nerdy thing and googled “60s dance parties in Columbus,” and there was nothing that met my specific needs. Hilariously, through DJing, I ended up obtaining this D-list celebrity status in Columbus. One of my friends told me it was funny that I thought I wasn’t “cool enough” because she’d thought my persona was so cool. I was like, no, no — it’s all an illusion. 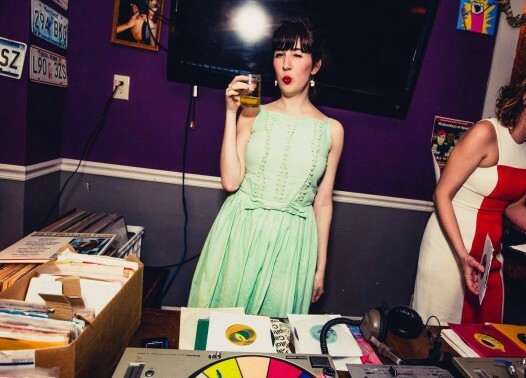 I was never the kind of person who could be a DJ — I just did it anyway. It’s an amazing mind hack. You can find Ann Glaviano’s publications and upcoming notices about her work at annglaviano.com. She also serves as the site editor of the New Orleans Dance Network, an online resource and advocacy organization for the local dance community. Catch Ann’s next DJ set at the HEATWAVE! Dance Party on May 13, at Twelve Mile Limit from 10 PM until 2 AM.